Math (check! ), spelling (check!) You and the children have managed to fit in most of the subjects. You’ve even folded the mound of laundry! But what about feeding the homeschool family? Now it’s time for lunch… or dinner! Hey, it’s even a challenge to offer up healthy breakfasts. Eat Your Way Around the World from GeoMatters – Our family is always on the lookout for interesting ways to add variety to our regular homeschool studies. With two teenage boys in the home, I was thrilled to find a geography related cookbook to go with our world geography studies. My boys never turn down the opportunity to eat. Eating the Plates: A Pilgrim Book of Food and Manners – One of my favorite ways to teach is to take a book and put it into action. Last Thanksgiving our family read Eating The Plates: A Pilgrim Book of Food and Manners by Lucille Recht Penner. This book offers so many opportunities for learning. Etiquette Intermediate by The Etiquette Factory – As the mom of two boys I learned very early on that “manners” are skills that need to be taught! Manners Made Easy – Please. Thank you. Yes ma’am. Sit down. Eat your peas. Drink your milk. Manners Made Easy For the Family is one, little pink book packed with Christian etiquette for all 365 days of the year. Southern Hodgepodge Cookbook bundle – Enjoy new recipes and tips for slowing down and savoring meals with your family without spending too much time in the kitchen. Who knows…you might find a new family favorite! The Curriculum Choice authors have active blogs where they regularly offer ideas and experiences about their homeschool adventures. Below are links they have shared to help you feed your family – even with all the joys and challenges of a day full of learning! 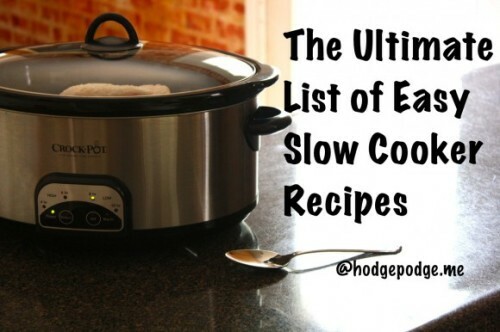 The Ultimate List of Easy Slow Cooker Recipes – Give me easy. Mix a few ingredients. Make it simply delicious. In the practical world of homeschooling and feeding a crowd on a budget, a long list of ingredients does not make the menu plan. I want to put the slow cooker to work while I take care of other things. In fact, the first month of back-to-school, I use the slow cooker almost exclusively. So here’s to easy, slow cooker recipes of all kinds! Make Supper at Lunch – I like short and simple, so here is the easy, three-step process for making supper at lunch. FREE eBook – Slow Cooker Batch Cooking – this is definitely the super supper saver! 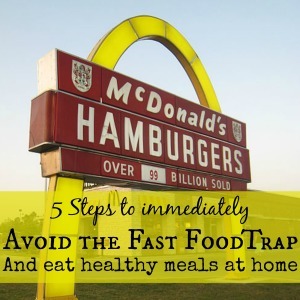 5 Steps to avoid Fast Food – Some days are just plain busy but I still want to feed my family a delicious and nutritious meal, without killing myself in the process. Tips & Tricks to Get Dinner on the Table Every Night – There have been times that I’ve struggled to get dinner on the table by dinner time until I implemented some of these strategies to streamline dinner preparations. 5 Tips to Save Money on Breakfast – This is a list of simple things you can do to save money on breakfast. Follow Kyle @ Aspired’s board Cooking up love in the kitchen on Pinterest. With lots of hungry eaters and a severe problem with gluten, our family spends a lot of time on food: growing, preserving, planning, cooking, and eating. Yet I try to be as efficient as possible, and simple recipes like Everyday Milk Nog, Pumpkin Slice, and Cauliflower Soup are both delicious and nutritious. An important way to put food on the table, both now and in my kids’ futures, is to teach them to cook. This is not always easy or efficient, but it always important and often an adventure, both in parenting and cooking. 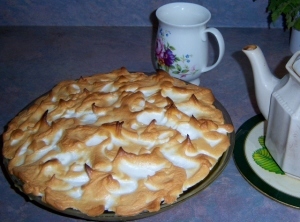 I’ll never forget Miss 9’s Lemon Meringue Pie. Theme meals can be fun and a great way to learn. Our Hobbit Style Second Breakfast was a scrumptious, gluten free celebration that we are all a bit nostalgic about. Follow Curriculum Choice’s board Simple and/or Slow Cooker on Pinterest. Our Curriculum Choice Simple and/or Slow Cooker, Healthy Breakfasts and our Homeschool Lunch Pinterest boards. 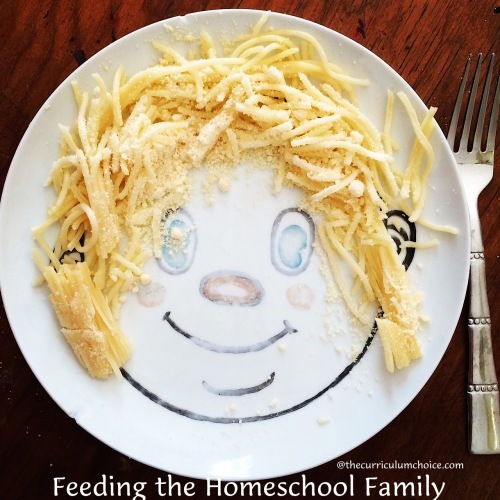 What are YOUR best ‘Get it on the table’ tips for feeding the homeschool family? Tricia, I love the idea of preparing dinner at lunch time. I started doing that this week, and it has really helped me. By the time that dinnertime rolls around, with our busy schedules, it is so nice to see that most of it is already done. Then I have lots of time to hear how my daughter’s day at college went….with the adjustments of it all! It makes SUCH a big difference for me too Betsy! I have ground turkey cooking in the slow cooker – some for sloppy joes tonight and some to tuck away in the freezer for the main ingredient in another meal. Enjoy that time with your daughter!